When The World Gives You Limes, Make Margaritas! Being a Mexican border state, Texas has long embraced the cultural and culinary stylings of our neighbor to the south. The words Tex-Mex, nacho, taco, and margarita come to mind, and Dallas has had a particularly long-standing relationship with the margarita. In fact, one of the claims to the origin of the heavenly drink hails from Dallas socialite Margarita Sames, back in 1948. The Dallas Margarita Society has also been hosting the Dallas Margarita Ball, the largest attended, annual, invitation-only gala in Texas (benefitting children’s charities), for more than 30 years. Consequently, there is a virtual cornucopia of marg offerings to be had in the Metroplex, often making it difficult to locate a stellar rita in a world full of lime Slurpees. The origins of this classic drink, widely considered to be based on the 1930’s cocktail, the Sidecar, which used brandy in place of tequila and powdered sugar instead of salt, are as elusive as that of the Martini. There are no less than 16 claims to its creation, the earliest of which occurred in 1934, in Matamores, by an unnamed bartender at the Los Dos Republicas restaurant. Other stories say that it was named after Rita Hayworth, whose given name was Margarita. Another states that it was created in Galveston, Texas by Santos Cruz, for singer Peggy Lee. While I lean towards the earliest claims, the true origin is anyone’s guess. Let’s talk about the perfect margarita for a minute. A truly exceptional margarita starts with top-notch ingredients and has just the right balance of sweet and sour. The first sip should grab you by the tongue and make you say “WOW!” It should be complex and interesting, with a nice body, and it should leave you wanting more, but let’s break this king of drinks down to it’s basic ingredients. 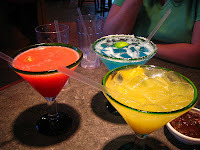 A margarita typically consists of lime juice, an orange-flavored liqueur, and tequila, served frozen or on the rocks, in a salt-rimmed, wide-mouthed, stemmed glass. Limes: The original recipes called for Mexican limes, which turn a pale yellow when ripe and tend to be a bit sweeter than their sour counterparts encountered here in the States. A bit of simple syrup or, even better, a little agave nectar can balance this out nicely. Orange Liqueur: In order of prestige – Grand Marnier, Gran Torres, Cointreau, Citronge, triple sec, or curacao. Tequila: A spirit made from Blue Agave, in the Mexican state of Jalisco and in and around the city of Tequila, about 40 miles Northwest of Gudalajara. Originally produced in the 16th century. Blanco – unaged, bottled and stored directly after distilling. Reposado – aged at least two months, but less than a year, in oak barrels. Anejo – aged a minimum of one year, but less than three, in oak barrels. The longer the tequila ages, the smokier and more mellow the flavor gets, and unfortunately the higher the cost becomes. In 2006 and Extra Anejo category was added for tequilas that are aged for more than three years. With over 100 tequilas to choose from, decisions can be difficult. They use agave nectar here! A great selection of top-shelf ritas to choose from, at a variety of prices. The Chipotle Chicken Poppers are worth the trip themselves. They’ve been making one of the best hand-made top-shelf margaritas in the country here for over 30 years, and they still do. Brunch is outstanding and the hand-made margaritas are of the highest caliber. Famous for their deserts. Try one of the top-shelf offerings from the huge selection of tequilas. Great “made-at-your-table” guacamole. 11 locations now, but don’t let the scare you; they still serve great drinks and food. And with $3.00 frozen or rocks ritas, sangria, and mojitos, all day long, you just can’t go wrong! I frequent the original Oak Cliff location. Supposedly, they made the very first frozen margarita ever, right here in 1971. Ya gotta try the original! Holy guacamole Batman! At brunch, on both Saturdays and Sundays, you can have up to three frozen or rocks margs or mimosas for $1.00 each. The meltdowns here will put you under the table. That’s why you can only have one if you’re not eating, so order some nachos and have three! The Mambo Taxi rules the roost here. Very strong, but made with cheap tequila. Two’ll do ya! Built inside a cool old movie theatre in Oak Cliff, they offer fluorescent green margs for .99 cents during happy hour! With the sweltering heat of the Texas summer upon us, go find that lost shaker of salt and take a trip to Margaritaville, or one of the multitude of Dallas area restaurants offering up that frozen concoction that helps us hang on. Fins up! Thanks for the shout out! We are happy to be included in such fine company. We'd also like to point out that on Wednesday nights our Margaritas are $.75 (limit 3 with purchase of an entree) You can't beat that with a stick!